Graduate student midfielder Haukur Hilmarsson vies for the ball during Saturday's home game against LaSalle. The Colonials failed to pull ahead of the Explorers in double overtime and settled with a tie. 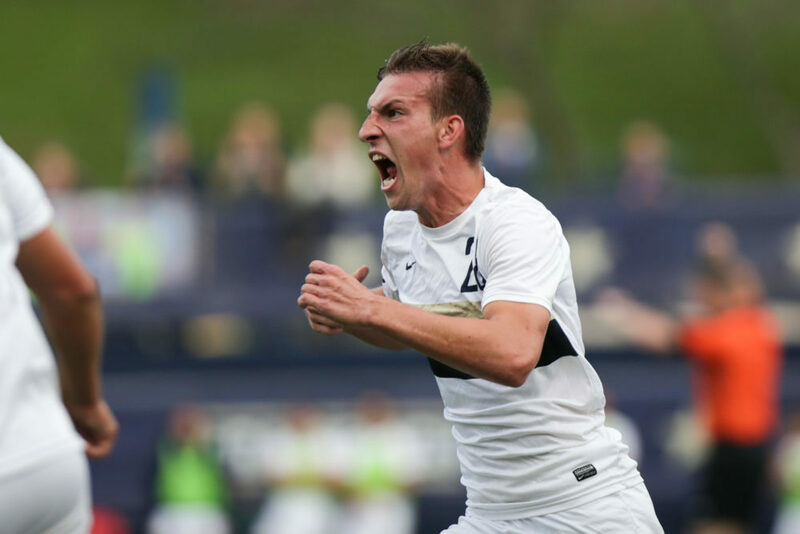 Men’s soccer (5-6-3, 1-3-2 A-10) could not find a way to beat La Salle in a 1–1 draw Saturday. The Explorers (2-10-3, 0-4-3 A-10) have not won since Sept. 1, but managed to secure a point toward their conference standings against the Colonials on senior day. The Colonials’ five seniors – goalkeepers Thor Arne Höfs and Jason Re, defender Alexy Boehm, midfielder Alastair Berry and forward Dylan Lightbourn – were all honored before the match for their four years on the team. Boehm netted his first career goal for the Colonials late in the second frame to equalize the game. GW outshot the visitors 22-15, but could not break through La Salle’s defense to net a game-winner. Senior defender Alexy Bohem celebrates his goal which tied the game up. The Colonials lacked the firepower of sophomore forward Oscar Haynes Brown, the leading scorer in the A-10 with eleven strikes, who sat out due to a knee injury. Twenty-two minutes into the match, freshman midfielder Alhaji Turay tallied the game’s first shot off a cutback from graduate student midfielder Haukur Hilmarsson. La Salle was playing with confidence and kept GW contained in its own half until the final 10 minutes of play, when the Colonials took control of the game. Sophomore midfielder Peirce Williams rattled off two shots but both efforts went wide of the net. But it was the Explorers who drew first blood with just two minutes remaining before halftime. Junior midfielder Max Holdsworth was stripped of possession in GW’s half and La Salle broke away. Freshman midfielder Daniel McIntosh’s cross found the head of freshman forward Omari Cotterell for a 1–0 lead over GW. GW came out of the halftime break firing, piling pressure onto La Salle for the entire period. The Colonials had multiple shots from distance and dominated possession, but lacked quality final passes needed to win, Jones said. The game shifted when Lightbourn earned a corner with 11 minutes on the clock. Holdsworth fired the delivery to the near post and Boehm jumped highest to power a header beyond La Salle freshman goalkeeper Brett Werner to put GW on the board. Boehm’s equalizer changed the complexion of the game, which became an open affair for the rest of the half, featuring end-to-end action and nail-biting moments for both teams. As the clock wound down to just two minutes left in regulation, Lightbourn had a golden opportunity to clinch the win. The forward was clean through on goal with only Werner to beat but his final touch was too heavy and the goalkeeper stifled the opportunity. A free kick 25 yards from goal with less than a minute remaining set up the potential for a dramatic finish and a GW win, but Holdsworth’s shot was tame and went straight into the arms of Werner. In extra minutes, the first goal-scoring opportunity fell to junior midfielder Colin Anderson off a corner kick. Werner was caught out of position by Holdsworth’s service and Anderson got the shot off, but a crucial deflection prevented the goal. Lightbourn threatened the Explorers’ goal yet again minutes later. He shifted the ball past his defender and struck a thunderous effort toward goal, but Werner made a save to push it off the post and away from danger. The game maintained its high tempo and tenacity with La Salle nearly scoring at the other end – but junior midfielder Drini Redzepi provided a crucial block on Macintosh’s strike. The second overtime period did not present as many clear opportunities for either side, as Hilmarsson’s effort from distance with six minutes remaining was the best of GW’s three shots in the frame. At No. 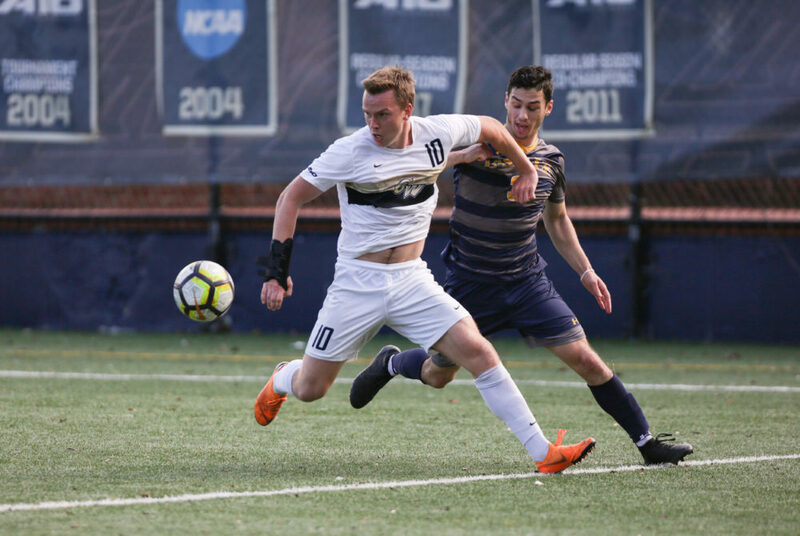 12 of 13 teams in the conference, the Colonials will need to win both of their remaining conference matches and hope for a boost from other teams to be positioned to qualify for the A-10 Championship. The Colonials will travel to take on UMBC in their final nonconference match of the season Tuesday. Kickoff is slated for 7 p.m.